Yard work can be an enjoyable, but often tedious task. As soon as one project is finished, ten more pop up in its place. Each new season brings with it a slew of new projects in your yard; raking leaves, pulling weeds, potting new plants, trimming hedges. When it comes to yard work, the list of projects is seemingly endless. The next time you are faced with a weekend of yard work, do not waste time searching through an unorganized garage for your tools. Many different storage options are out there to help you find a perfect spot for each of your tools within the limited space of your garage. Consider using any or all of these awesome storage ideas to find a comfortable home for all of your valuable yard tools. When left on the ground, or strewn about your garage, yard tools become dirty and are easily broken. Unorganized tools, especially sharp ones, also pose a threat to children. For safety and cleanliness, organizing your tools is key. The market is flooded with thousands of garage storage options. In a sea of storage racks, shelves, and cabinets, finding an option that works within your garage can be overwhelming. 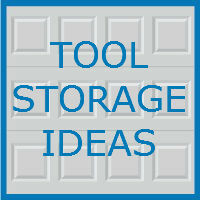 The first step in finding the right storage option for your garage is taking stock of the tools you have. There is no need to purchase a storage system for ladders if you do not own any. The same goes for every tool, so before building or buying any storage options, make a list of all the tools you need a home for. You may find yourself with an odd assortment of items of varying sizes and storage requirements. Do not feel overwhelmed. As impossible as it can feel, there are many easy to build or purchase storage options that will whip your garage into shape in no time, no matter your time or budget. Cabinets are a great option. Many home improvement stores sell basic garage cabinet systems in various sizes and shapes, depending on your needs. Cabinets with closed doors are a great way to keep your yard tools out of sight and can make your garage feel much more organized. If your list of yard tools is relatively small, installing cabinet storage may be all you need. Another advantage to cabinets is safety. For families with small children, yard tools can be a safety hazard. Many cabinets provide lockable doors that may be necessary for the safety of your children. Any sharp tools or dangerous chemicals, like weed killers, can be locked up. Additionally, cabinets come in a variety of different styles to fit your organizing needs. Look for a cabinet system with built in shelves or drawers if need be. Shelves, racks, and benches can all three be extremely useful organizational tools. Shelving can be purchased or built by hand, depending on your time and ability level. Shelves can be a great place to store tools, gardening equipment, and supplies like pots and soil. Many shelves are higher up off the ground, keeping things away from children’s hands. A work bench, often known as a potting bench in the gardening world, can also serve the same purpose. Potting benches can be purchased premade, or can be built out of left over desks or tables. They are a great place to do smaller gardening tasks like potting flowers, and also provide many storage possibilities. For additional storage, look for a potting bench that has either drawers or cabinets beneath the work station. For larger tools, like rakes and shovels, consider a tool storage rack. Racks can be built by hand or purchased, and allow for easy storage all in one place. A storage rack also has the advantage of being movable. If you are planning a long day of yard work, simply move your storage rack out into the yard with you for easy access throughout the day. Many people leave lots of space in their garage underutilized. There are many different options for wall and ceiling storage within your garage, depending on your needs. A slatwall, or slotwall, is one of the most common options for wall storage. This storage system uses grooved panels that attach to your garage wall that allow hooks, basket, and shelves to be hung from them. This is an extremely customizable option. Need a place to store your rake? Simply purchase or build a hook for it that fits into the slat wall. Find yourself with tons of little shovels, gloves, and gardening accessories. Find a basket or other storage container that is compatible with a slatwall. Another similar option that can be even more affordable is pegboard. Pegboard can also conveniently be painted, allowing it to blend into any garage. There are many stationary wall storage options available as well. These storage options are typically made for longer tools, and feature places to store rakes, hoes, shovels, and pitchforks. If you are out of space in your garage, or find yourself needing to store larger items like ladders, look upwards. You may only have a limited space between your garage door (when it is opened) and your ceiling, but this little bit of room may be the perfect size for a ladder or two, or various other tools. On a side note, ceiling storage is also a great idea for kayaks or paddle boards. As you can see, the possibilities for storing your yard tools in your garage are pretty endless. Assess your space and your tools, and start organizing from there. For more garage related topics, be sure to follow this blog. To inquire about the services we offer in the Chicagoland area, contact Blue Sky Builders online or call (630) 852-8485.